Winners of the London International String Quartet Competition in 1988, the RTÉ Vanbrugh Quartet’s performances include concerts, radio and television appearances in Europe, the Americas and the Far East. Based in Cork as Resident Quartet to the national broadcasting service, Radio Telefis Éireann, the members of the Quartet are also Artists in Residence at University College, Cork. In recognition of their services to music in Ireland they were presented with the 1995 National Entertainment Award for classical music. Highlights of recent seasons include Beethoven cycles in the UK, Ireland and Sweden as well as major festival appearances in the UK, Spain, Portugal, Holland, Germany, Hungary and the Czech Republic. In July 2000 the Vanbrugh Quartet represented Ireland at the Europamusicale festival of chamber music in Germany, Hungary and the Czech Republic. 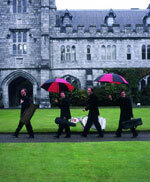 The Quartet broadcasts regularly for the BBC and other European stations as well as for RTÉ. A live European Broadcasting Union recital in December 2000 went out to an audience of some four million listeners throughout Europe. The Vanbrugh Quartet has released numerous CDs, including the complete Beethoven quartets, works by Haydn, Schubert, Dvorak, Janacek, Dohnanyi, Copland, Robert Simpson, John Tavener and many of Ireland’s leading composers. In 1996, the Quartet co-founded the West Cork Chamber Music Festival, based at the spectacular location of Bantry House. With its adventurous and uncompromising programming, the event has quickly established itself as a major event in the European musical calendar. Regular EBU broadcasts and a television documentary in 1998 helped spread the Festival’s reputation and the 2000 and 2002 Festivals were featured on BBC Radio 3. In 2003, the Quartet gave the world premiere of a new piano quintet by Deirdre Gribbin, entitled Speakers Corner, which was also performed at this year’s Spitalfields Festival.